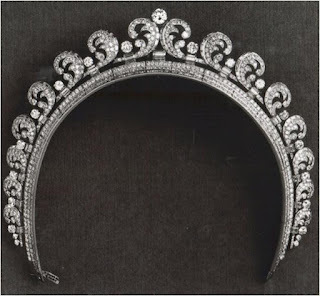 Another tiara known by several names (mainly as the Scroll Tiara, prior to 2011; the Halo Tiara, Cartier Halo Tiara, or Queen Elizabeth's Halo Tiara since then; I have also written about it as the Halo Scroll Tiara), this was made by Cartier in 1936 from diamonds and platinum. It was given by The Duke of York to The Duchess of York shortly before they became King George VI and Queen Elizabeth. It doesn't seem to have been worn very often by her; she favored larger pieces as queen. The Cartier tiara was given to Princess Elizabeth as an 18th birthday gift in 1944, another wartime birthday "re-gift". 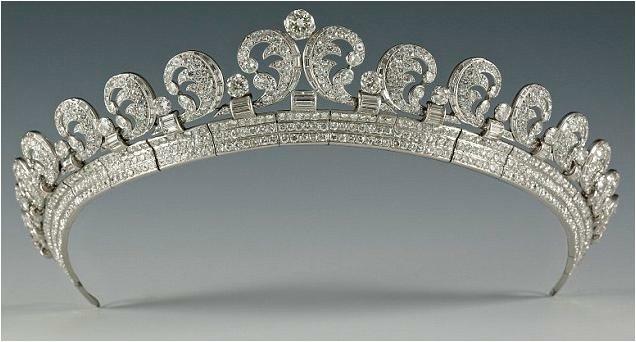 I suspect this may have been The Queen's first tiara, but (to my knowledge) she has never been pictured wearing it. By the time she started wearing tiaras in public, she was married and had more options at her disposal. She loaned it to Princess Margaret and Princess Anne, who both used it as young women. They both stopped borrowing the tiara as their own collections grew. After a few decades in the vault, The Queen loaned the Halo Tiara to Catherine Middleton for her wedding to Prince William in 2011. As of this writing, we have not seen The Duchess of Cambridge wear the tiara again. It was on loan to a Cartier exhibit in France when it came time for her first post-wedding tiara appearance, so she moved on to the Lotus Flower Tiara and then on to the Cambridge Lover's Knot Tiara. The Duchess' wedding earrings, diamond gifts from her parents that match this tiara, have also not been seen publicly since the wedding. Read more about the tiara here, in my original post at Order of Splendor.